← How can Technology be used to help keep education relevant at all levels? There is no question that learning in the internet age is completely different from any time in history. Traditional structures, routines and institutionalized practices in education (like all other industries in 2014) are being categorically replaced by the promise of technology for a more open (and seemingly endless) access to resources, expertise, information (in varying degrees of relevance and accuracy) Most importantly, technology’s potential to connect individuals, experts and learners from across the globe in real time is quite profound. In the last decade in particular, the classroom with its familiar set up of desks, chairs and chalkboard can potentially be replaced as a monopolizing hub for learning as we can learn anywhere, collaborate locally and globally and frequently do using technology The potential for redefining learning tasks and the struggle to survive and hopefully thrive in this new learning environment, has been experienced by all stakeholders in education including the learner at the center, parents, teachers, administrators and politicians. This post will explore four topics of areas of discussion: curriculum relevance, the role of standardized testing, socio-economic disparities and finally the resistance to change traditionally characteristic of our educational settings. The problem based learning model and approach by Dr. Desjardins is vital to our analysis as we take on the roles of the stakeholders and attempt to identify the problem, current situation, desired situation, obstacles, knowledge and resources towards approaching a solution from one perspective and then from another perspective and so on. No question that our curriculum has to evolve to make the needs of students today (at least?!) and tomorrow (ideally). A significant majority of students feel disenfranchised in schools. (Ito et al., 2013) They seem disinterested in both the content and pedagogies that characterize traditional approaches to learning in K-12 environments. (Ito et al., 2013) We, as educators, have to be committed to change, upgrade and re-define tasks if we are to attempt to prepare students for an uncertain future with important life and learning skills. As always, the focus must be on creating an enhanced and connected learning environment rather than teaching technology in isolation. According to Heidi Hayes Jacobs, educators should be upgrading and updating tasks constantly to help prepare students for tomorrow rather than learn the skills of yesterday. She suggests a number of updates to consider: content and assessment (what to keep, cut, create and add to a portfolio? ), program structures (by grade, use of time, space), use of technology, media literacy, globalization, sustainability and habits of mind (thinking habits to all succeed in life). A mention of Dr. Punterdura’s SAMR model is also a relevant and important lens to critically and honestly examine all learning with technology. When integrating technology into instruction and learning, perhaps our goal for updating is to move an increasing amount of tasks to the re-definition level. From a curriculum leader or administrator’s perspective, providing opportunities for staff to become connected through school collaboration embedded into their weekly schedule would also aid teachers to plan rich learning experiences (more re-definition tasks) for students. Another invaluable solutions is encouraged our teachers to become connected educators who use external collaborations, social media like Twitter, webinars as well as action research and conferences to aid their students and learning community. The accessibility to leading educators, researchers, academic and pedagogical leaders as well as experts on any topic through digital means (i.e. Skype, email, IM etc.) is too rich a resource for educators and administrators to pass up. In short, creating connected educators with vibrant Personal Learning Networks (PLN) is going to be a more powerful way to upgrade curriculum and learning for students than traditional top-down staff meetings or even one-off conferences. From the student and parent perspective, each of these stakeholders is keen to experience activities that showcases a student’s strengths and prepares them for future success. Engagement then becomes key and seeking connected learning experiences is one strategy where the learner can participate, learn by doing, face constant challenge and be able to explore the interconnectedness of learning not only to prepare them for the outside world but as an active participant immediately. An example of this is found on the Scratch 2.0 website where enthusiasts of coding and programming from all walks of life are able to share, remix and build programs by topic, function or theme. From collections of projects by topic, subject even principles like loops provide a venue for showcasing and learning skills in a public setting purposefully. Sites like Scratch, Google Apps, Prezi or Voice Thread (link to more by parts of the SAMR model) where creativity is encouraged and designers have the option to share work to a limited or specific and when appropriate a wider audience will not only motivate and engage but also allow students to become digital leaders with a positive digital footprints upon graduation. Funding and support for open source and publicly funded learning initiatives can certainly aid the digital divide that is taking place in Ontario and to an even greater extent internationally. (Chen et al. 2014) As most initiatives and educational technology move to a cloud based model, access to a web enabled device unlocks a wealth of rich learning opportunities for students. Luckily, the price of one device is becoming increasingly affordable to point of complete market penetration. Bring Your Own Devices (BYOD) initiatives in schools can increase the integration of technology in class as along as students who arrive to school without, are provided with a device without stigma or a vast gap in access to tools accessible to others. (i.e. If classes are using tablets, students should not using computers and vice versa.) As educational technology becomes increasingly entrenched in schools, parents with limited purchasing power are going put tremendous pressure on schools to provide devices to maintain equity. Partnerships between companies and schools in need can also be encouraged by politicians and administrators to provide devices in a mutually beneficial exchange of student use for ethical and discrete data collection and research. BYOD can help but can also reinforce inequity and therefore a 1:1 environment with all teachers and students sharing a similar device is more ideal. Governments also have a role to place in providing funding for technology hardware and seemingly free educational materials (software, digital textbooks, web based etc.) accessible by all students in a learning community or province. The example of Bitstrips for Schools is one web tool where a powerful and creative online tool is freely available to Ontario students. Administrators and school leaders have an important role in advocating the needs of the students and considering the resources, tools and especially technology to meet the needs of their students. Educational institutions have traditionally been skeptical to changes and adopting new technologies and learning practices in the classroom is wholly dependent on the teacher. (Chen et al. 2014) This critical approach has merit when the focus is on maintaining a high standard of learning in the classroom but has to shift as the teacher-learner relationship evolves in the internet age. Educators no longer have a monopoly on knowledge and in the information age, students from all ages have the potential for greater knowledge on a specific subject than the instructor. Successful instructors will shift their focus on process and provide opportunities for students to demonstrate a synthesis of their ideas, adapting one format (writing to multimedia or multi-sensory etc.) or even leaving it up to the students (depending on the age) to select their own form of expression to meet the learning goals. This flexible model creates an environment where change is welcome and adapts to the needs of the students. Administrators are also encouraged to support teachers whose innovative practices help their students and by allowing them to share with others in their internal school PLN and external PLN to more input and suggestions. An open approach to new ideas and modes of learning is a strong element of creating a vibrant learning community. Another important resource for all stakeholders in educators (from the learner to the politician) is the adoption of a growth mindset as proposed by Carol Dweck. By transitioning to a growth mindset rather than a fixed one, all stakeholders in education are encouraged to note that our skills, achievements and practices are not fixed and can constantly evolve to be better and more effective. No doubt failure is an important, necessary and acceptable outcome for new ideas and initiatives. This is so true when working online as “pulling the plug” or horror of ‘no wifi” can bring Plan A to a grinding halt! However, the capacity for new student centered models where parents, educators, curriculum leaders, principals and politicians all work from the mindset that FAIL stands for “First Attempt in Learning” encourages innovation and risk taking that forms the basis for the economy in society today and in the future. Another quote that supports a dynamic of change and innovation is from Heidi Siwak “You are only ever working with your current best idea.” This expression of integrative thinking offers an approach that would help educators and administrators use the tools (in our case technological) currently available to help students but be willing to reflect, critically examine, change, revise and update when a new approach or technology becomes available. Collaborations, partnerships and connections between many perspectives leveraged through technological tools and face to face discussions and interactions become critical for growth. Creating connected learners, educators, parents and politicians allow all stakeholders to share, debate and discuss new approaches to learning and education. Learners need to feel that they can connect their ideas and interests to curriculum whenever possible through technological tools like social media, cloud based creative and productivity tools, educational games and simulations. Parents need to model themselves as the “primary educator” in their child’s life, supporting a growth mindset and seeking help and be recipients of support when social, societal, economic factors inhibit the growth of their child. 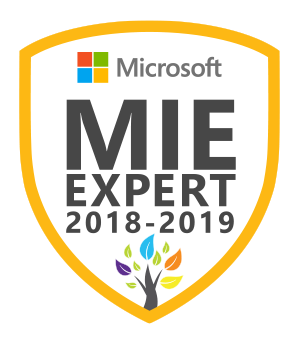 Educators need to similarly adopt a growth mindset with their curriculum documents, adapting to the newest, best expressions of technology and supported by investigations and interactions within their PLN. Administrators need to focus on school wide assessment practices of both students and educators to create a vibrant learning environment where each student has an individual learning plan and both educators and students are continuously looking to grow with confidence. Politicians are in a position to look longer term and support Ontario’s citizens in each stage of life, with learners at the center, while considering the needs of parents, educators and learning communities with funding, support and a growth mindset. 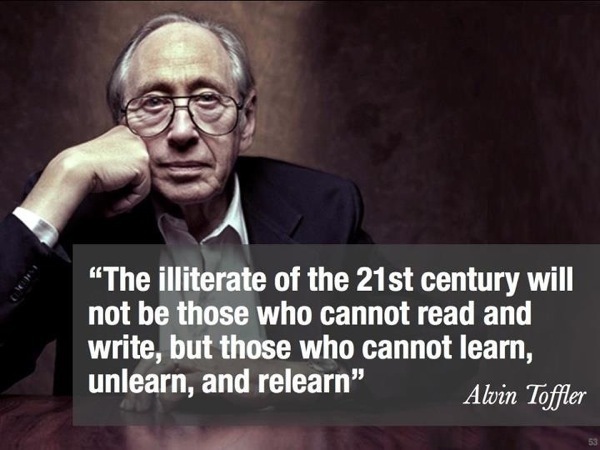 In short, technology’s promise is tied directly to an individual’s ability to learn, unlearn and relearn as Toffler states below. Achieving Excellence: A renewed vision for Education in Ontario, Government of Ontario, 2014. 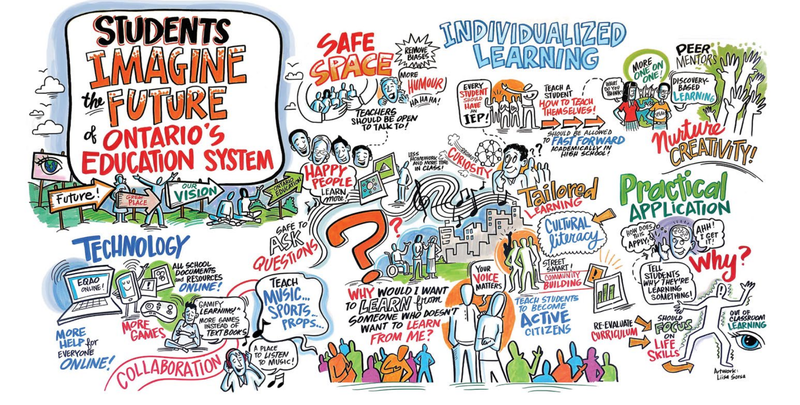 Digital Learning in Ontario Schools, People for Education, 2014. Desjardins, F.J. PBL: Thoughts on the “Role” Effect, 2011. Ito et al. Connected Learning: An Agenda for Research and Design, 2013. Jacobs, Heidi Hayes (editor) Curriculum 21, 2010. Puentedura, Ruben R. SAMR and Curriculum Redesign 2014.